Asbestos is a group of minerals found in nature and is used as part of many building structures. As a material, it is strong, heat resistant and inexpensive. However, asbestos can be dangerous and has been shown to cause cancer. Asbestos can enter your body through the eyes or lungs and primarily targets the respiratory system. Asbestos exposure to the eyes occurs when asbestos-containing materials is disturbed and the fibers become airborne. Asbestos can get in eyes during home remodeling, when construction workers are renovating or razing a building. People, such as custodians, who work in areas of old buildings where asbestos may be present are at risk of asbestos exposure. The best way to avoid getting asbestos in your eyes is to wear protective safety glasses. Asbestos can irritate your eyes like any foreign body or dust particle. Because asbestos is a silicate, if it gets into your eyes it can cause them to become irritated. The level of irritation can be minimal to extreme, depending upon the amount of asbestos that enters the eye. 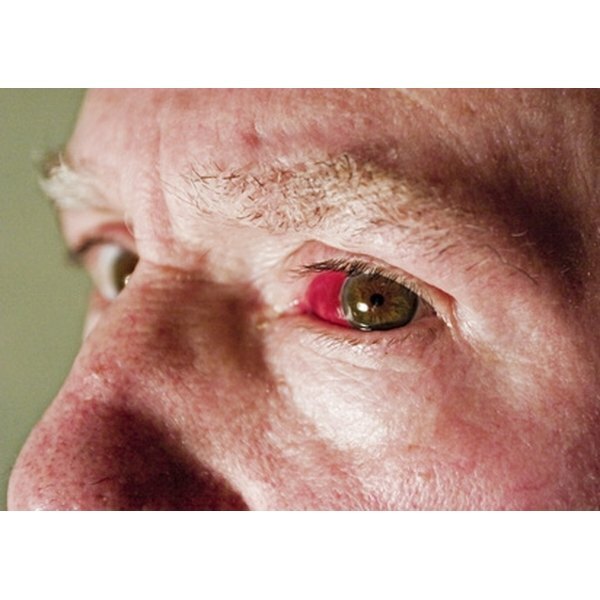 Symptoms of asbestos in the eye include itching, burning, scratching, redness, sensitivity to light and tearing. Though not common, asbestos particles can penetrate and become lodged inside the eye. There may be little or even no symptoms initially. If you think you have asbestos in your eye, rinse your eye with an eyewash or pure water (even if you do not feel anything in your eye). Resist the temptation to pluck or pull anything that may be embedded out. Instead, seek help from an eye care professional as soon as possible. Eyes will usually heal quickly once the asbestos fibers are removed. Your doctor may prescribe an antibiotic ointment to help speed healing and avoid infection.